We aim to provide the swords at a price competitive with other such reproductions. How much each sword costs will depend on the final cost of materials for producing the sword, and the larger swords (Ice or Longclaw) will be more than the smaller swords (Needle). We aim for all of the swords to come in at $150-$300. As said in the original announcement, we’re making stainless steel display swords, not functional swords. High carbon steel functional swords of the quality we would want to release would be $600-$1000 or more each, this is out of the price range of most collectors. If there is sufficient demand we may go back and make functional versions of the swords on a very limited basis. It is understood there are many purists out there that disdain stainless steel display swords, however to make a sword at an accessible pricing level with the kind of quality we desire it has to be stainless. So for those who only want functional swords and nothing else please be patient, you may just get your wish. Will There Be Preodering (a waiting list)? Yes, just as soon as the first prototype is done and we have pictures to show you what you will be buying we will open things up for preorders for those willing to put down deposits. Will You Make XYZ Sword? We’re not just making Valyrian Steel blades. We plan to make all the popular arms and armor from the series. So yes, Dawn, Needle, the Kingslayer’s sword, possibly a Dornish spear, or the Hound’s helmet, these will all be made, assuming there is sufficient demand anyways. Can You Ship to XYZ Country? We’ll be able to ship most everywhere in the world, however many countries forbid the import of weapons and consider display swords to be weapons. Other countries require the recipient to have a special license. If you’ve never bought a sword before you should check the laws in your country to make sure you can buy one and have it imported. This is a new business for us and this line of swords will be our first, however we are dedicated to delivering to collectors a top of the line display sword in both quality and aesthetics. To this end we have obtained the services of industry veterans who have worked for other manufacturers and on other reproductions from books or movies. The lead designer for our sword line is a 20 year veteran of sword & knife design. He has worked on reproductions from the Lord of the Rings movies, has his own line of fantasy swords, and has had his works featured in dozens of other movies and TV shows. We have been working very closely with George R.R. Martin through each stage of the design process, and he has final approval on all sword designs to make sure they follow his vision of Westeros as closely as possible. 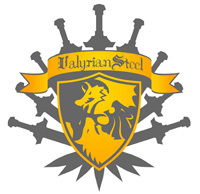 Our initial goal is to produce all of the major Valyrian steel swords mentioned in the ASOIAF book series, as well as the prominent non-Valyrian blades such as Needle. Each sword will be a limited edition run of 2500 pieces and will include a certificate of authenticity personally autographed by Mr. Martin himself. These swords will be high quality display pieces and will come with plaques bearing the crest of the house which holds the sword. Depending on the success of the line we will expand into other arms or armor from the series or possibly produce an even more limited line of battle-ready reproductions. The first sword in the series will be Longclaw, once the sword of the Mormont’s, now wielded by Jon Snow. The concept art for this blade has been completed and approved and we will be releasing it to you in the future. We aim to have this sword ready for sale in 2008. We will be taking both retail and wholesale orders from this site, as well as providing updated information on designs and release dates. So please bookmark this site or subscribe to updates by entering your email address in the box on the right so that you can be advised when we have new information for you. If you have any questions about the line, please leave a comment and we’ll do a FAQ post that answers the most common questions.